Happy New Year! 2012 has rolled in fast and I can't tell you how much Jeff and I are looking forward to clearing out 2011. Some of you may know, Jeff had to have yet another surgery the Wednesday before Christmas - this was on his knee, the same one they operated on this summer. This makes the 4th surgery he's had within a year - his neck, shoulder and twice on the knee. The surgery went fine and he's on the mend, with plenty of physical therapy coming up to get him back in business. It was very last minute and tossed a wrench into our holiday plans, but we are both glad we got it done and out of the way. My on-going issues are not so easy, but there may be a glimmer of hope with an appointment at the Center for Functional GI & Motility Disorders at the University of NC. This won't be happening until March, so sadly there are a few more weeks to go. I've mentioned that I've been having to follow dietary restrictions and we've gotten a few e-mails as to what that entails. My doctor has me following something called the "low-FODMAP" diet. You can read more about it here if you fancy - this is a diet based from a researcher in Australia that is gaining in popularity here in the US. It can be fairly complicated, convoluted and confusing, especially because many of the websites out there have conflicting information about what you can and cannot eat. 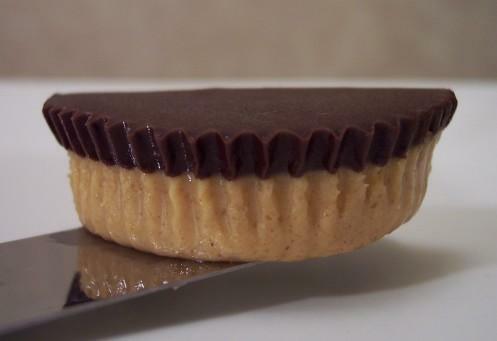 The research is constantly changing, based on the details obtained as they test different foods. Many of my most coveted, favorite foods were on the list to avoid and it was difficult to get started, but I've been doing my best to follow it. However I haven't seen much, if any, improvement yet and it has been several weeks. We're looking forward to seeing what the specialists at UNC have to say, though I can't say I will be getting my hopes up. So, here's to 2012 - the year with minimal doctor appointments (hopefully! ), answers to those unanswered questions and leading a healthy, happy life! 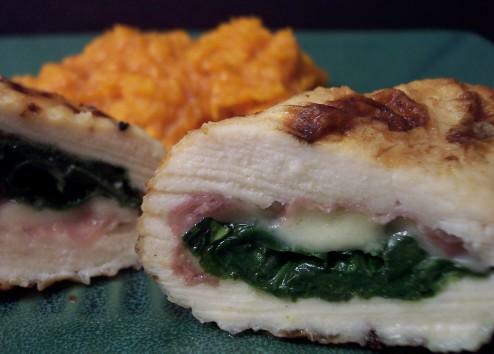 With that news out of the way and you know what we've been up to the past few weeks, I can catch you up on some of the recipes I've been making for Jeff. He is able to enjoy eating a variety of foods and at least I can gain some pleasure by making it - that's something, right? It's the small things in life. 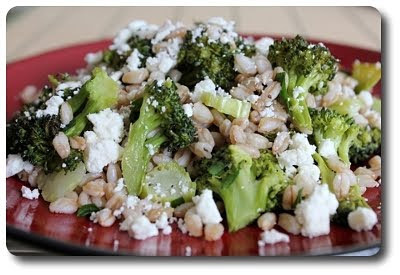 This Roasted Broccoli and Farro Salad with Feta was one dish that I almost cheated with, but I held out with a sad frown and a bowl of rice. What I liked about this dish was that it can easily hang out at room temperature for awhile without worry - no rush to make certain it is served pipping hot. I used to only be able to find those earthy, lightly nutty grains of farro in either ginormous bags at Costco or tiny ones at a local market marked up ridiculously high in price. Thankfully, one of our favorite shops has started carrying it in the bulk bins, making in a snap to grab just what we need. Cooking time for the farro can vary depending on what you pick up - pearled farro (hull removed) can be done in as little as 20 minutes, where "whole" farro (hull retained) will take closer to 45. 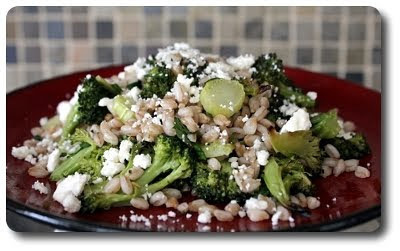 While the farro takes its time in a hot bath of bubbly, salted water, it was refreshing to see that the recipe calls for using the entire stalk of broccoli, rather than just the brilliant florets. With the florets cut into bite-sized pieces, the beefy stalk is peeled to remove the fibrous outer layer, revealing its sweet, crisp and under-appreciated stem. Sliced into coins, both the florets and stem are simply tossed with extra-virgin olive oil, salt and fresh ground black pepper, to be roasted in the searing cavern of our oven. You'll know the broccoli has been cooked enough when there is a slight char and the stem rings give under pressure with a knife. 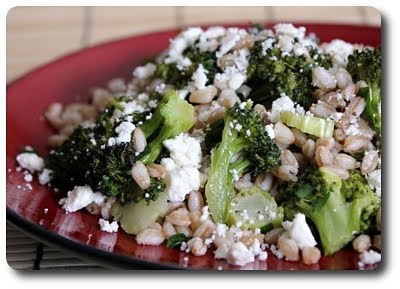 The duo are slid into a large bowl, to be tossed with the plumped, pleasantly chewy farro, creamy nubs of salty feta, sliced scallions, fresh parsley and crushed red pepper for a hint of spice. Salt and fresh ground pepper are sprinkled on to taste (be sure to take a small bite first just to see first before you add anything), along with a drizzle of red wine vinegar for an acidic punch. To give a bit of glisten, and of course, a fruity finish, just a tablespoon more of your favorite virgin olive oil rounds out the dish. Just before you serve, take another greedy taste for yourself - you may want a dash more vinegar as it may have mellowed out as it married with the rest of the ingredients. For variety, think about using half, or even all, cauliflower instead of the broccoli, or go wild and nix it all together for another vegetable like asparagus.